These shoes are very easy to walk in. I have been walking in platforms for years and this is the only pair i don't feel even a bit tippy in. yes there is alot of toe room but it is because the base of the shoe is very wide which makes it so you won't feel so off balance. Of all the platforms i own this is also the only pair i don't really feel the "height," again i think it is because of the wide base of the shoe. I work in these shoes and they are comfortable to walk in for 9 hours a day. Great buy. 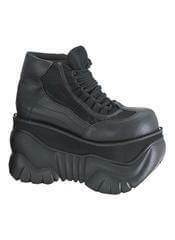 A wondeful shoe. Very easy to brake in. Very comfortable. A good shoe for people who have just started to wear platfrom boots and shoes. I would highly recomend.